Egyptian Minister of Higher Education Mustafa Mosaad on Sunday visited the campus of Nile University (NU) in 6 October City to inspect the premises after students ratcheted up pressure on the government – through a sit-in and hunger strikes – to reopen the campus, the doors of which were closed in the wake of last year's Tahrir Square uprising. Following Egypt's revolution, the government gave all NU land to the Zewail City for Science and Technology (ZCST), named after prominent Egyptian chemist and Nobel laureate Ahmed Zewail. As a result of the move, NU students were banned from the campus premises. Since then, NU students have resorted to attending classes in a makeshift campus in Egypt's Smart Village, a high-tech industrial park in 6 October, a satellite city west of Cairo. Other less fortunate students, meanwhile, have been forced to travel to universities farther afield to use their laboratory facilities. Given the situation, dozens of NU students have been staging a sit-in for the last 11 days at the NU premises to demand that the campus reopen so that they might resume their education. ZCST officials, for their part, remain tight-lipped on the issue. "Dr. Zewail told us not to speak to the media until the situation cools off," ZCST spokesperson Rawya El Daby told Ahram Online. "He applies the politics of scientists when facing propaganda, which is to be silent. He is expected to come next week, when we hope a solution to the situation can be found." Since last week, several NU students have upped the ante by declaring hunger strikes, which they have promised to maintain until the campus opens. In a show of solidarity, a number of students at other universities have reportedly joined them. "My colleague and I have been on hunger strike for four days," NU student Mostafa Shamaa, who is also a former student union president, told Ahram Online. "And, since Tuesday, we've been joined by students from other universities." Shamaa expressed little faith in the new government's ability to successfully arbitrate the issue. "The new government doesn’t care about the issue," he said. "It's exactly like the previous government, which had similarly ignored students from the German University in Cairo (GUC) when they went on hunger strike." In March, a handful of GUC students declared a hunger strike to demand the reinstatement of several colleagues who had been expelled for on-campus political activism. Amira Abdul-Hameed, a recent graduate of the American University in Cairo and founder of a student leftist group, joined the NU hunger strike in solidarity. According to her, the students are protesting "on principle." "The government’s research and development budget currently stands at less than 1 per cent," she told Ahram Online. "So when a university offers students the chance to carry out research, and then the university's work is hindered for political reasons, a stand must be taken." Abdul-Hameed added: "I expect they will reach a compromise solution, but this will take time." The recent escalation didn't come as a surprise: NU students on Saturday issued explicit warnings that they would go on hunger strike if the government failed to meet their demands, chief of which is allowing students immediate – and permanent – access to the NU campus. Student protesters' second demand is the official acknowledgement of NU as a "civil university," i.e., one owned by the people. "NU was supposed to have been formally recognised as a 'civil research university' by the former regime in January of last year," Mahmoud Allam, one of NU's founders, told Ahram Online. "But then the revolution erupted and the issue was put on hold by the subsequent post-revolution interim governments." NU was originally established in 2006 as a private not-for-profit university. Only in 2009 was a law passed allowing the establishment of so-called "civil universities." Such universities are neither private nor state owned, but are rather "owned by the people" via donations and contributions. In January of last year, the law was approved by Egypt's Supreme Council of Civil and Private Universities. But before it could be formally approved by longstanding president Hosni Mubarak, the Tahrir Square uprising broke out, throwing the university's fate into uncertainty. "We stayed at the university campus for one month before being evicted by the government of Ahmed Shafiq [Mubarak's last prime minister]," said Allam. "Since [former prime minister] Ahmed Nazif was also arrested on corruption charges after the uprising, the land he had originally allocated for NU's permanent campus was given to Zewail's project by order of Egypt's Supreme Council of the Armed Forces." Meanwhile, ownership of the NU campus remains ambiguous. "When we met with Zewail, he told us that nothing in the NU campus belongs to us," said NU founder Allam. ZCST spokespeople, for their part, say that NU officials had formally conceded the property to the Zewail City project. "NU conceded the land to us. Dr. Zewail has nothing to do with the issue," Mohamed Ghoneim, who sits on ZCST's board of trustees, said in a televised interview last month. Allam, for his part, asserted that an "individual decision" had been made by Akeel Bashir, a former NU board member, to concede the campus premises to ZCST, "and Bashir signed a document to this effect." Zewail, Allam added, "had proposed to merge both entities on condition that the university was formally done away with." According to NU Student Union President Ahmed Nassar, Zewail had called for NU to be merged with the Zewail City project. "But how can we merge with an institution that itself is not yet a clearly-defined entity?" he asked. Nassar added: "If Zewail has an idea that will benefit Egypt, we respect this – but he has to leave one of the two buildings on campus for us to work in." In an interview last week with independent daily Al-Shorouk, Beshir suggested that NU continue using the campus buildings that had been financed by the communication ministry and through individual contributions, while leaving the remaining 127 acres of land to the Zewail project. 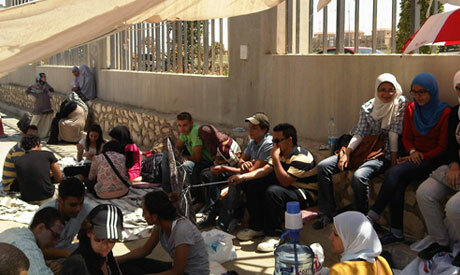 In the meantime, NU students are continuing their sit-in – in Cairo’s soaring summer heat – in front of NU's main building. The fight, however, will be a "tough one," according NU staff member Gihan Kassem, especially given Zewail's exalted status in Egypt. "We're essentially fighting someone – Zewail – who we were reading about when we were in grade school. This is difficult," said Kassem. "People warn us: 'You're starting a fight with the Arabic Einstein'." "But why does it have to be a competition?" he added. "Egypt is a country of 80 million people; we need more than one university – in fact, the more the better." He went on to ask: "Why can't we share the laboratories? Why can't we have two universities located in the same campus?" NU research assistant Mohamed Nassar, for his part, lamented the poor allocation of resources while defending NU's initial achievements. "The only electronic lab of its kind in Egypt – which cost some $600,000 – has been collecting dust for two years now because we have no place to put it," said Nassar. "And whoever says NU hasn't accomplished anything, just open Google Scholar and type 'Nile University Cairo' and you'll find as many research papers as you want." The recently-built NU campus is located on a vast tract of land – some 127 acres – provided by the state. Although it contains two well-equipped main buildings and numerous classrooms, it is currently empty of all life except for the security guards that sit at the entrance. "It's unfortunate," said Kassem resignedly. "I've never heard of a university without a campus." How did you created this mess? Ready, Fire, Aim. LOOOL Backward people.